IGIS and the California Naturalist Program are pleased to help celebrate the launch of a new information portal on climate adaptation. The California Adaptation Clearinghouse was officially launched at the California Adaptation Forum in August in Sacramento. The site was developed by the Governor's Office of Planning and Research (OPR) in collaboration with the UC Berkeley Geospatial Innovation Facility, CalNat, and IGIS. The Clearinghouse is a database-driven platform with a wealth of curated resources for climate adaptation. The site originated out of Senate Bill 246, which mandates OPR to provide resources on climate adaptation for local governments, regional planning agencies, and other practitioners working on adaptation and resilience. The database also contains sea-level rise resources collected by the Ocean Protection Council under Assembly Bill 2516. It's an amazing resource for anyone looking to strengthen climate change preparedness in their local government, community, or business. The database includes numerous planning resources that have been developed and vetted by experts in the field. For example, the Urban Sustainability Directors Network has a how-to guide for local governments on developing equitable, community-driven climate preparedness plans, which you can find in the Clearinghouse. There are also examples of vulnerability assessments, local plans, and funding strategies. The majority of resources are hosted by other organizations, but unlike a Google search all the resources in the Clearinghouse have been reviewed, annotated, and cataloged by subject matter specialists. To help find resources, the Clearinghouse has a number of search options, including more than a dozen topic categories adapted from Safeguarding California, the state's overall roadmap for building climate change resiliency. You can also search by Type of Impact (e.g., drought, sea level rise), Resource Type (e.g., case study, assessment, policy guidance), and of course an interactive map. Each resource has a descriptive blurb so you can quickly find what you need. Adaptation planning can be information intensive, so the Tools and Data section of the website is devoted to helping people find data and crunch the numbers. Interested in rangelands? Check out the CA Landscape Conservation Cooperative's compiled Threat Assessments to California Rangelands. Sea level rise? Perhaps the CosMos modeling tool from USGS, or the Surging Seas tool from Climate Central. Like all resources, each tool and dataset has a user-friendly description, a technical summary, a bit about the data, and links to the source. One of our favorites is the California Energy Commission's Cal-Adapt, which includes both historical and projected climate data downscaled for California. 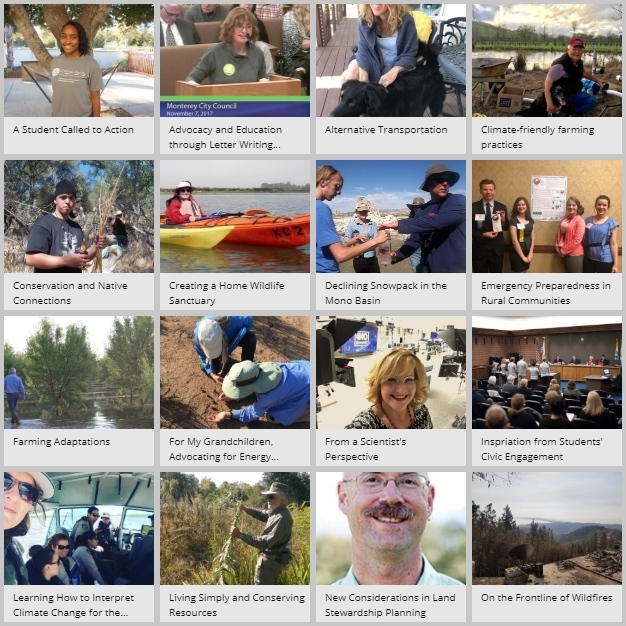 Providing a more personal perspective, the Clearinghouse also contains stories about climate adaptation from individuals, community groups, and businesses. The stories were collected by the UC ANR California Naturalist Program and their vast network of certified naturalists. The climate stories are diverse and compelling, from a concerned grandmother who becomes engaged in a community choice energy program, to a solar project engineer working to strengthen measures to prevent heat stroke in field staff. An interactive Story Map developed by IGIS helps users find stories from their area, some of which even have audio or video clips so you can hear the story in the speaker's own words. Climate adaptation is complicated, but information portals like the Clearinghouse allow anyone to tap into the incredible amount of work that has already been done in California and elsewhere. Rather than reinvent the wheel, local agencies can build upon vetted guidelines from similar areas. We are all fortunate that the State of California has invested in a platform to share curated resources for the long-term, because climate adaptation is already part of the new normal. More resources are in the pipeline, so check it out and then check back often to see what's new.